So the season is over for the Washington Redskins and for Kirk Cousins, it was over a month or so early as he was pulled from action in lieu of Robert Griffin III and Colt McCoy. Oddly enough, I’ve read books about each of them in the past year or two also. But in reading GAME CHANGER, it is clear that Cousins is going to be okay, whether he’s benched or starting. He obviously strives to start and succeed in the NFL, but he lives with a purpose and vision beyond the gridiron lines, Gatorade showers, and screaming fans. For such a young guy, he’s already experienced a lifetime of challenges, failures, and successes, as well as plenty of twists and turns along the way. However, through it all, Cousins keeps his focus on the bigger game plan. 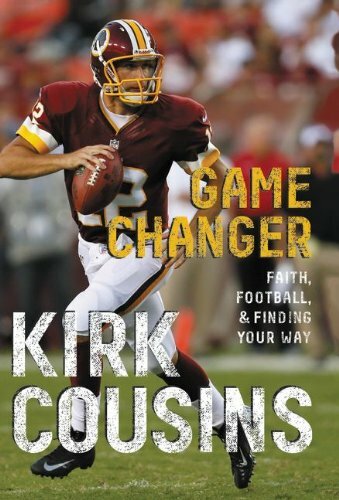 In GAME CHANGER, Cousins shares his journey, offers inspiration through his story, and passes along helpful advice for others, regardless of their current situation. This is a helpful book for younger readers – maybe 10-18 years old – looking for identity, success, and help along the way. And hey, today is New Years Eve (as I write this), so what better time than the beginning of a new year to read through an inspiring tale to get you ready to tackle (pun intended) those resolutions in the coming months.